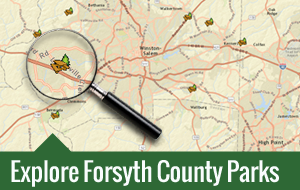 The Arboretum and Gardens at Tanglewood Park showcases plants that grow in Forsyth County, NC. The Arboretum is managed by North Carolina Cooperative Extension, Forsyth County Center, in partnership with Forsyth County Parks and Recreation and Extension Master Gardener℠ Volunteers. The Arboretum is open to the public during the normal operating hours of Tanglewood Park. Monthly educational classes are offered at the Arboretum. Please click here for details on upcoming classes. The Arboretum and Gardens at Tanglewood Park strives to provide a quality horticultural destination that inspires an appreciation and understanding of the relationship between people and plants. Please click here to view the flyer with more details about this spring’s adult education classes. See the Trees of the Arboretum and Gardens at Tanglewood Park brochure.